Poland is currently developing its first maritime spatial plan which is expected to be completed in 2019. A study (“Study of Conditions”) was carried out preceding the planning process with the intention of gathering all the necessary planning information. In this study, national defence, security and safety were given a prominent place. 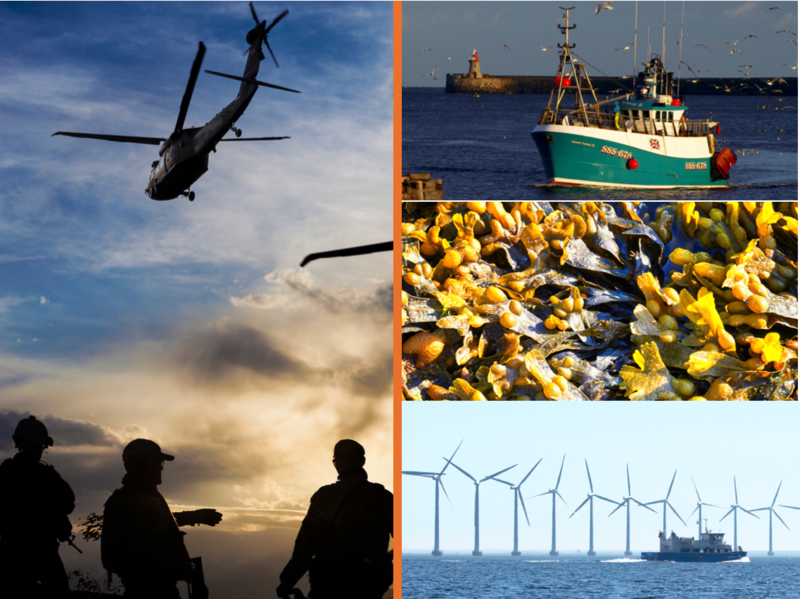 The UK Ministry of Defence is a consultee for the licensing of marine developments, to ensure offshore activities and developments do not adversely affect strategic defence interests or inhibit the use of designated Danger and Exercise Areas. During the planning process in Lithuania, it became apparent that a newly established biosphere area overlapped with a military training area. There was a third overlap in the same space with an old dumping site for dredge spoil which had been there for a long time. Military use of the sea, or the use of marine and coastal areas for purposes of security and defence, is a reality in all coastal countries. The spatial needs and interests of national defence and security at sea are complex, so potential conflicts may not be immediately obvious. Maritime activities could get in the way of military infrastructure. For example, there have been concerns that wind turbines could interfere with defence radar or military underwater cables. There may also be negative impacts on optical, radio and hydroacoustic observation and the possibilities of veiling. Maritime activities can impede the proper functioning of marine infrastructure that is considered indispensable for national safety and security, such as pipelines, transmission cables, data cables, etc. Maritime activities can interfere with naval training areas, artillery ranges or airbases, in other words, areas that need to be free of obstacles. Acute spatial conflicts usually arise when defence interests restrict other permanent uses. Coexistence is often possible with more fleeting uses that do not impede military activities in principle, such as tourism, fishing, or even shipping; in these cases, measures such as temporary closures can often be used. Policy-wise, issues of national defence usually take precedence over all other activities. This does not mean that compromise is impossible, but it does mean that military needs cannot be negotiated to the same degree as others. In some coastal areas, the navy is an important employer, adding socio-economic “weight” to the political weight of the sector. Very often, the military cannot be explicit about its spatial needs. Reasons of security may also prevent a fixed military training zone from being designated, or from making such a zone explicit on a map. The military is a “hidden” yet powerful stakeholder as a result of its high national priority. It can prevent other activities and impose non-negotiable restrictions on other sea users. Due to this power difference, it is all the more important for planners to act as mediators. Compatibility matrices have been used to examine the potential spatial conflicts between national defence and other sea users in projects and MSP processes. The BaltSeaPlan project identified severe incompatibilities between military training areas and offshore energy and gas and oil extraction. 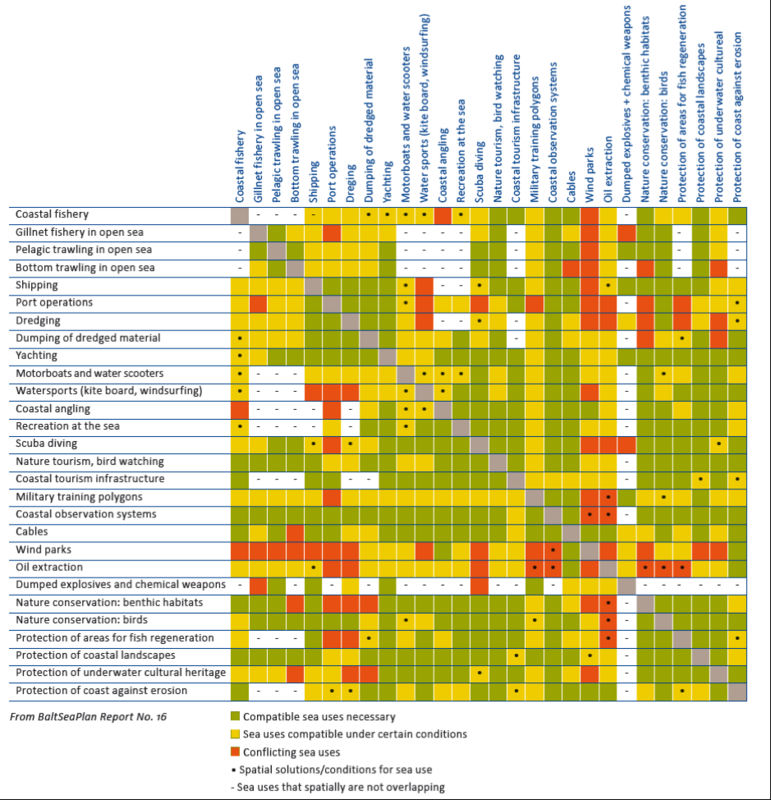 Other conflicts were found to be open to mitigation under certain circumstances and conditions. For example, military training grounds can temporarily be opened to other uses when they are not being used for military training. During the official planning process in Latvia, defence and security were also analysed in a compatibility matrix by the Ministry of Defence. Incompatibilities were found with diving, wave energy, mineral extraction and in case of munitions dumping also with bottom fishery and fairway maintenance. 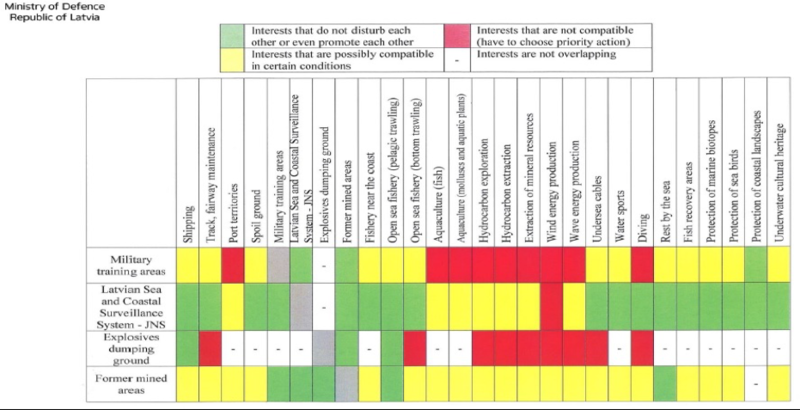 Compatibility matrices show that incompatibilities and the potential for co-existence come down to the type of military activity that is to be carried out. There is a difference between military exercise needs, which are often related to safe navigation or weapons testing, and munitions dumping, for example. When it comes to developing planning solutions, the first step is to identify areas of military or security importance during MSP stocktaking. This can be done in combination with a compatibility matrix to get an idea of the specific military concerns and possible conflicting activities. 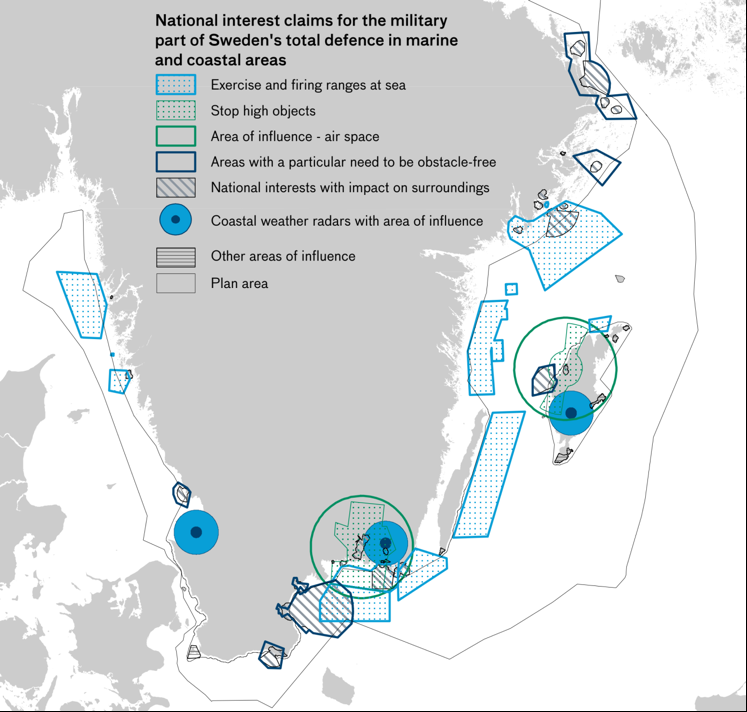 Sweden held a series of workshops to identify potential spatial conflicts between other sea users and defence interests. They were attended by representatives from SwAM (including GIS experts), the Swedish Armed Forces (SAF), the Civil Contingencies Authority, the County Administrative Boards, and a consultant. The Armed Forces provided information on national interests of defence; they also analysed how other interests might affect their areas of importance and interests. The most apparent conflict turned out to be the incompatibility between inflexible installations (such as wind turbines, aquaculture and other infrastructure) and some of SAF’s use of areas and systems at sea. Exercise and training areas for operations at sea and in the air. Here, permanent installations risk damaging the national interest. Areas where no new tall objects can be erected. These are mostly areas in close proximity to military airbases. Wider areas of influence related to air space, e.g. where minimum safe altitude must be ensured. Areas with a particular need to be obstacle-free, e.g. military artillery ranges. Areas of particular importance for coastal weather radar, where tall objects can be a disturbance. Other national interests with impact on surroundings. Other areas of influence. Some national interests cannot be presented openly for reasons of secrecy. Here, individual reviews are required in each case. Shipping/boating: The Right of Innocent Passage granted by United Nations Convention on the Law of the Sea (UNCLOS) could in certain circumstances significantly disrupt MOD operation where, for example, vessels from a marina regularly cross a range danger area in territorial waters. In such cases, by-laws could not be enforced against the Rights of Innocent Passage and firing would have to cease. By-laws continue to be enforceable within internal waters. In England, the Marine Policy Statement states that “Marine activities should not prejudice the interests of defence and national security and the Ministry of Defence should be consulted accordingly”. Planning policy for specific planning areas is then formulated in line with this statement (see Box below). A similar situation exists in Scotland. The National Marine Plan sets out specific objectives for defence, stipulating that in certain areas, proposals for development and use should be discussed with the Ministry of Defence at an early stage of the licensing process. It goes on to say that “where potential for conflict with other users is identified, appropriate mitigation will be identified and agreed with the Ministry of Defence, prior to planning permission, a marine licence, or other consent being granted.” The Ministry of Defence is in a strong position as it can establish by-laws for exclusions and closures of sea areas, including also a code of conduct for fishers. In Sweden, defence and security (“total defence”) is one of nine MSP objectives. The Swedish Environmental Code, which provides the foundation for MSP in Sweden, states that “areas that are important for total defence purposes shall, to the extent possible, be protected against measures that may be detrimental to the interests of the total defence”. In cases of incompatibility between national interests, priority must be given to defence interests if the area is needed for defence. In Poland defence and security were given top priority (accorded basic function) in some sea areas located in internal and territorial waters. , as well as the status of an overarching use that can restrict all other uses even those having top priority in a given sea area like shipping or ports in the areas dedicated to navigation, These restriction however should be of the character that does not undermine the basic functions of a given area (so e.g. shipping can be stopped for several days in the year but this should be dully announced). However even most interesting is attempt of solving conflicts in which defence had to accept territorial claims of other sectors (mainly ports and shipping). This may require even reallocation of training grounds. Such proposals were included in Polish MSP and talks were initiated under supervision of the Ministry responsible for MSP in Poland. Defence and security can also be regulated more comprehensively. The difference here is that the decision is not left to the licensing stage, but is taken more generally as part of the plan itself. This creates specific non-controversial conditions for coexistence between sectors and can make planning more effective as decisions do not have to be taken on a case-by-case basis. 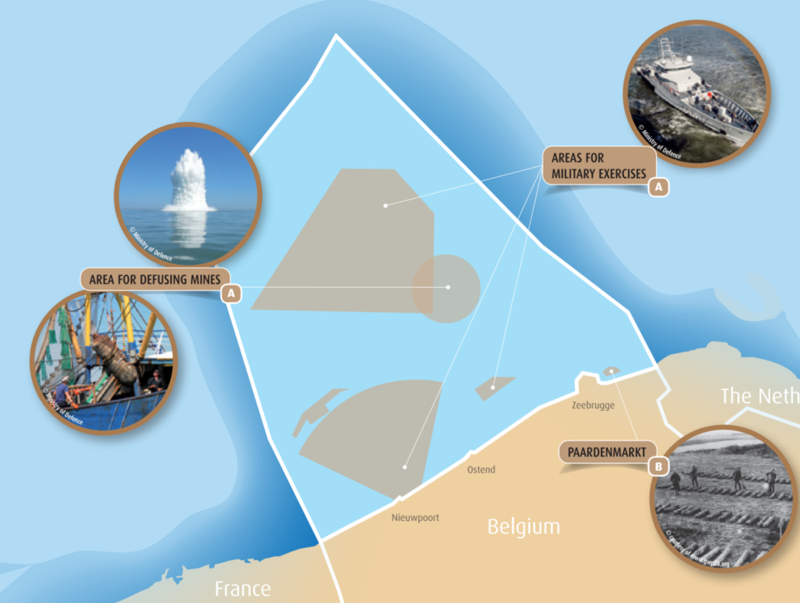 In Belgium, the marine spatial plan delimits a closed munitions deposit area which dates back to the First World War. There are bans related to activities touching the sea bed, such as fishing and sand and gravel exploitation. The main concern here is safety and security of the storage site (see picture). In Poland, a list of very concrete restrictions is provided in order to secure the superiority of security and defence needs in these areas. Restrictions on the size and height of constructions were put in place in line with suggestions from the Ministry of Defence in order to not restrict visibility from military airports or radar posts. Activities that may interfere with technical and visual observation as well as radio communications are prohibited in the vicinity of such military complexes. Defence was given the status of “basic function” in the key training grounds in Polish territorial waters, which means that according to Polish law, it cannot be restricted by other functions. In these key training grounds, restrictions are therefore placed on other uses, such as laying cables or pipelines. Safety is also a key concern in the Polish plan. For safety reasons, it was decided that offshore wind farms should be accessible to SAR and other emergency services. These services have been granted a general exemption from any navigational restrictions imposed on other forms of shipping. The Belgian plan delimits several zones for military activities where no shipping, fishing, dredging and exploitation is allowed during military exercises. Other sea users are informed in due time by means of a “notification to sailors”. The compromise is that shooting exercises are forbidden during weekends, bank holidays and school holidays. In Scotland, the fishing industry and the MOD have an agreed code of conduct which aims to resolve conflicts arising from the respective activities. These agreements are drawn up directly between the Ministry of Defence and the sector, a process that does not necessarily require MSP. Nevertheless, the marine planning process can facilitate a range of aspects related to voluntary codes of conduct. This includes stocktaking, careful identification of the problems at hand, or dialogue between the sectors. MSP can also help to identify compromises, e.g. that fishers can enter military areas at certain times and that fishery bans do not take place during the most productive fishing season. MSP can also supplement such processes by providing relevant planning information. Mechanisms for MSP include organising facilitated stakeholder discussion, face to face consultation groups with the navy, or dedicated working groups between planners, the navy and other affected sectors, as was done in the Lithuanian planning process. Marine spatial plans can be used to inform potential developers of the interests of national defence and security in given sites. Information can also be provided on the role of national defence and security authorities, e.g. as part of the licensing process, to allow bilateral discussions of concrete cases and solutions. This is an option if there are alternative areas for military use and if there are overriding interests in another sector. Usually, this requires a discussion of proposals among competent authorities and may take time. In Lithuania, some military training areas were relocated due to environmental concerns. This solution depends on the nature of the available sea space and will only work in areas where there is sufficient alternative space. National defence and security can also offer useful synergies with nature conservation. Military areas can prevent some types of environmental pressures simply because they restrict other activities, although military activities add other pressures during exercise (e.g. heavy metals from ammunition, noise, physical destruction). If military training areas are not used or restricted for other reasons, they can act as effective conservation areas. Synergies with nature conservation ultimately depend on the intensity and type of military use and the type of natural values at stake (e.g. sea floor habitat, water column). The question is whether military impacts are more or less destructive than other activities that would otherwise go on in the area (e.g. anchoring). If the natural values are located on the seabed, for example, many defence activities can continue without disruption, offering effective protection from other pressures and impacts.